Weather-wise we didn’t have a very good day, but sightseeing was wonderful. It rained last night and was dreary looking when we got up. We slept until 8 A.M. We figured out our transportation options, boarded a tram across from our apartment to the train station. Then took the underground metro (U 3 – Orange line) directly to Stephendom. We have a nice apartment but it is not as close to the center of town as the others. We had our rain jackets but it was cloudy, windy and cold – about 50 degrees. The first St. Stephen’s church was around 1137. At that time it stood outside the city walls. The original cathedral (and today’s cathedral) was oriented toward the point in the southeast where the s un rose on December 26, 1137. In the Acts of the Apostles it is recorded that St. Stephen saw the opening of heaven just before he died. The first rays of the sun falling on the high altar and illuminating the interior symbolize this “open heaven.” Very little of the first church has survived. The next church was a Romanesque church erected between 1230 and 1245. There was a fire in 1258 and a new church was consecrated in 1263. Between1304 and 1340 the Gothic triple-apsed choir was begun. The church rose slowly but steadily over the next 100 years. The South Tower was com pleted in 1433. The construction of the North Tower was began in 1147. There is an interesting oral tradition which reports that the emperor ordered that the current year’s wine, which was unusually sour, be used as the bonding agent in the construction of the tower foundations. At the beginning of the 16th century, construction of the tower was suspended. The last layer of stone bears the date 1511. Economic and social tensions put an end to the grand design of the me dieval building. In the middle of the 17th century the cathedral was restyled in Baroque fashion. During the second Turkish siege of 1683, the church was hit by more than a thousand cannonballs. By the 19th century there was more restoration to the church which had been suffering from neglect and deterioration. Some new neo-Gothic furnishing were added. Although over the centuries the cathedral had withstood two Turkish sieges and wars with France, nearly half of it was utterly destroyed in the final days of World War II. 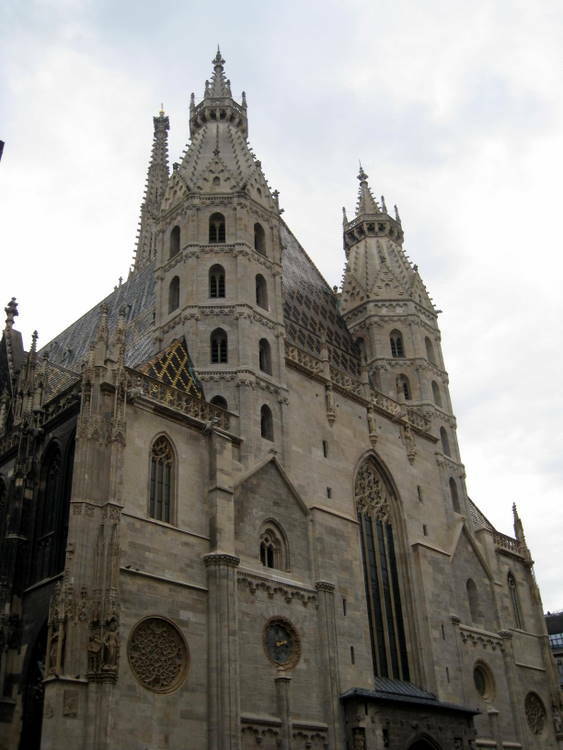 Due to the efforts of the archbishop, Cardinal Theodor Innitzer and the help of the citizens of Vienna, the church was rebuilt. The first mass was celebrated on December 19, 1952. The roof is of great interest. 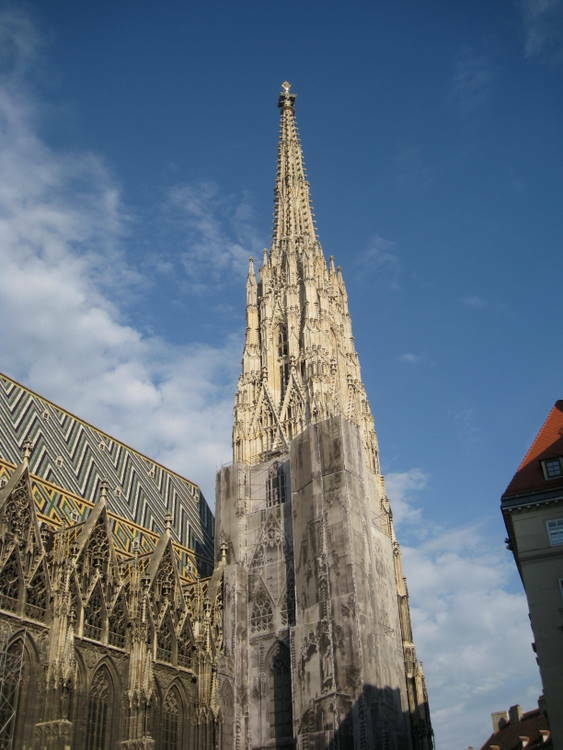 Before the bombing and fire of 1945 the roof truss consisted of 3,000 tree trunks. The roof construction now is of 605 tons of steel. 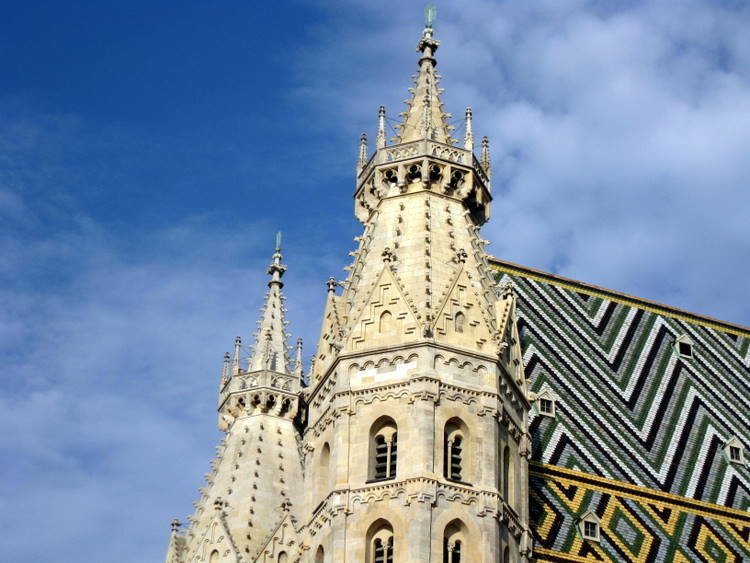 There are 230,000 multicolored glazed roof tiles. It is said that if these tiles were laid out end to end, they would extend more than 31 miles. On the south side over the choir is the coat of arms of the Austrian Empire, the date 1831 and the monogram F.I. (Francis I) can be seen. 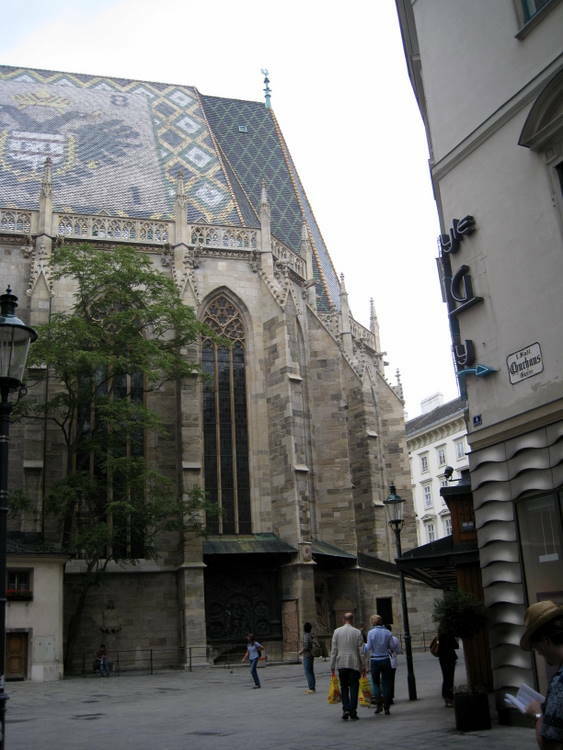 On the north side is the emblem of the City of Vienna and the Second Republic. Click here to see my model. We were able to go right into the Stephendom. You can walk around the outside aisles without paying an entry fee, but have to pay to go in the center aisle…so we paid. There was a noon mass, complete with music. We were happy to be able to attend since we had originally planned to attend yesterday, but decided to go to Melk Abbey instead. 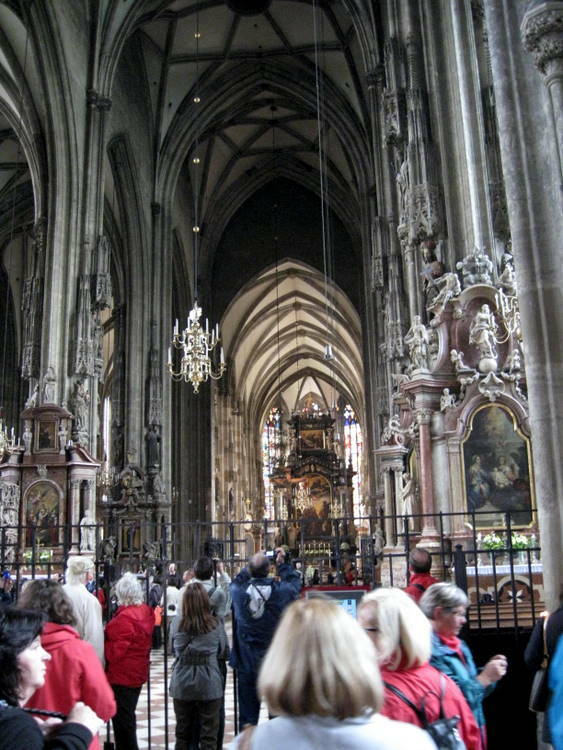 Of course the service was in German, but as in St. Vitus we were able to follow the service. The front half of the church was full. Followin g the service we were able to walk around in the front part of the nave before they opened the doors to the public. Some of the areas of the church were then closed to the public. The cathedral is 111 feet wide and the length is 444. These dimensions are based on combinations of sacred numbers. The interi or is very Baroque and quite beautiful. 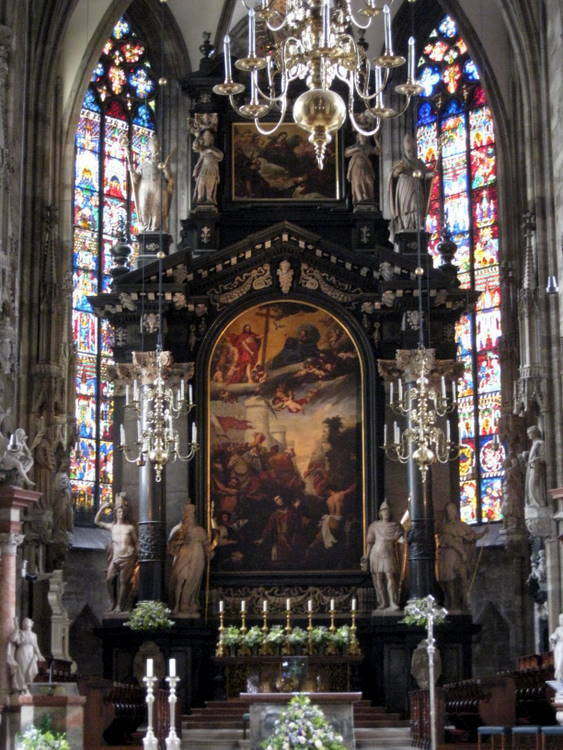 The high altar was consecrated in 1647. The altarpiece shows St. Stephen being stoned to death in front of the walls of Jerusalem, with heaven above him, wide open, and Christ at the right hand of the Father. 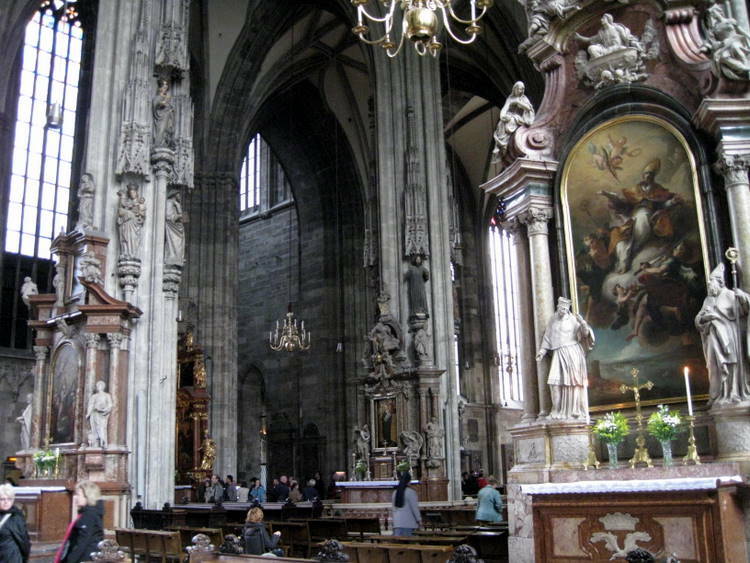 There are seventeen ornate Baroque altars in front of many of the pillars of the nave. The pulpit is magnificent. It is like a flower blossom. Carved on the upper section are four Latin Church Fathers (Ambrose, Jerome, Gregory and Augustine) who lean out like the petals of the flower. There are smaller statues between these four representing the twelve apostles. At the bottom is a figure looking out of a partially closed window. 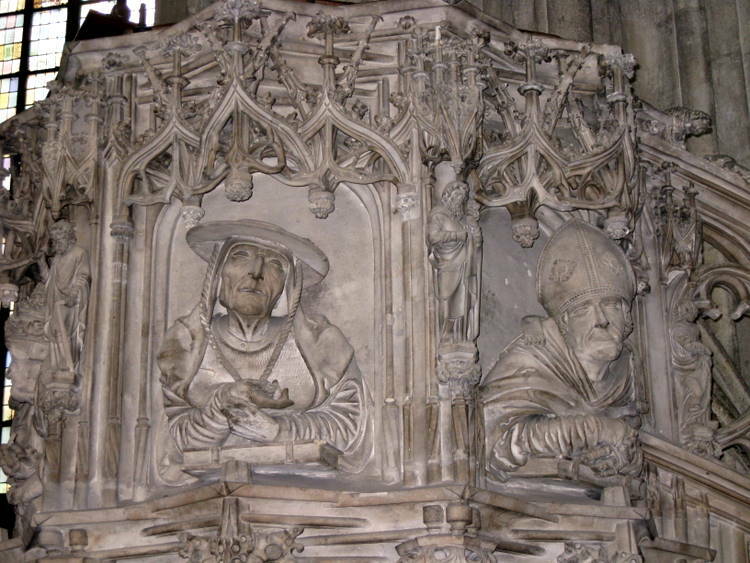 He is called the “window gazer”, the self-portrait of the unknown artist of the pulpit. We could have spent the rest of the day looking at all of the wonderful paintings, windows and statuary – but we didn’t. Afterwards we found a café, Wienerwald Restuaant on Goldschmiedgasse 6, a street right in front of the Dom and had lunch. I had grilled chicken breast, rice and veggies and my wife had lasagna. 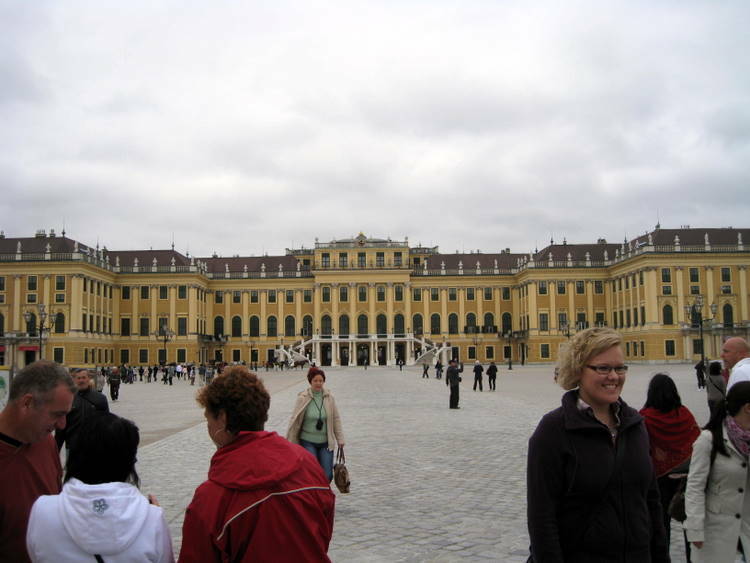 Our next adventure was to go the Schonbrunn Palace which was southwest of the cathedral. We went back down in the metro station and took the Red Line – U1 south to the next stop – Karlsplatz and changed to the green line U4 west to Schonbrunn. We were proud of ourselves finding the correct trains. We had to walk a couple of blocks to the Palace. It began to drizzle and turn rather cool. I wished that I had my sweater under my jacket. The history of Schonbrunn goes back to the Middle Ages when the whole estate was known as the Katterburg and belonged to the manor of the monastery at Klosterneuburg. In 1569 the estate and manor house came into the Habsburg ownership through Maximilian II. 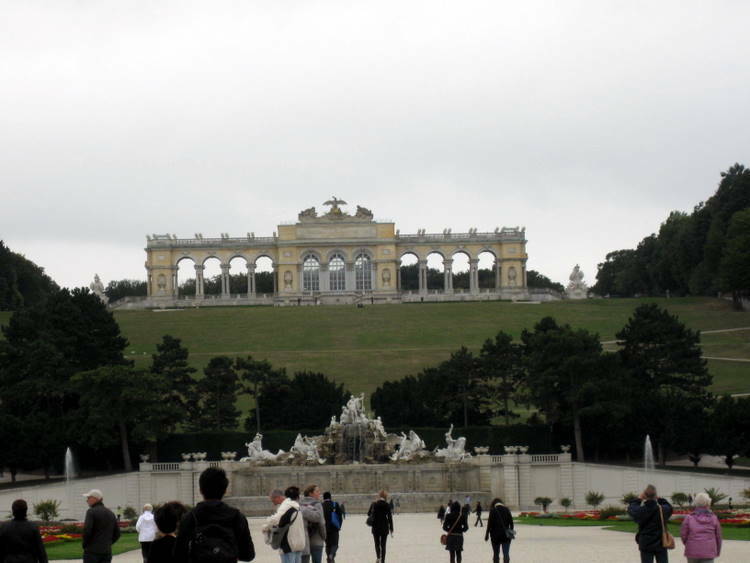 Ownership passed to other emperors until 1683 when the palace was devastated by the Turkish siege of Vienna. In 1686, Leopold I rebuilt the palace for his son, Joseph. In 1700 the central wing was completed. Because of the shortage of funds the plans for the side wings was abandoned. 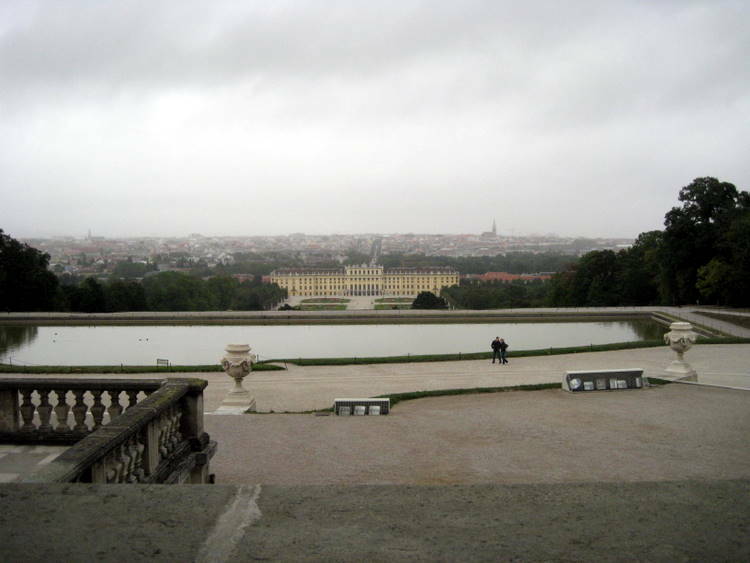 Emperor Charles I acquired Schonbrunn in 1728 and gave it to his daughter Maria Theresa. During her life and rule, the palace expanded to what it looks like today. Maria Theresa used it as her summer residence until her death in 1780. In 1848, Maria Theresa’s great, great grandson, Franz Joseph became emperor of Austria and occupied it for the next 68 years. We had no trouble buying admissions tickets to the Palace. We took the complete inside tour using audio guides. Of the 1441 rooms, forty are open to the public. It was a wonderful experience seeing so many beautiful rooms. No photos were allowed inside. We went to the front garden to take a picture. It was drizzling and getting dark. 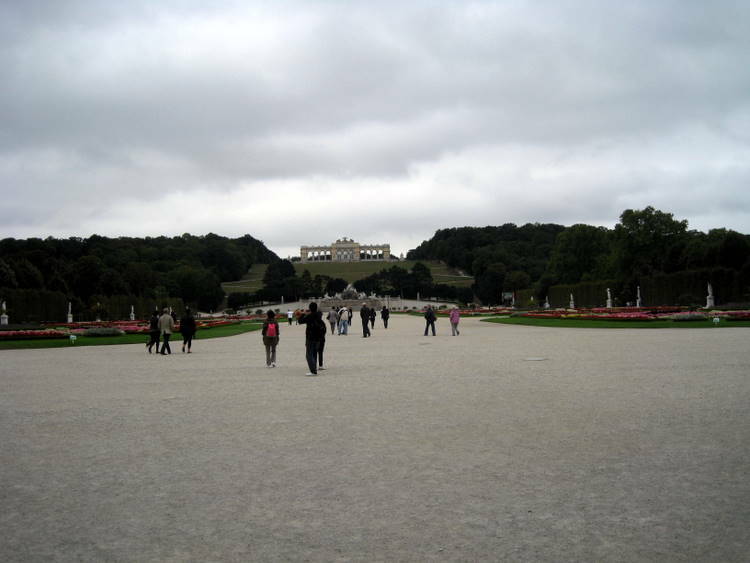 We decided that it was too far to walk up to the Gloriette. The Gloriette was built in 1775 as the last building constructed in the garden as a "temple of renown" to serve as both a foc al point and a lookout point for the garden, it was used as a dining hall and festival hall as well as a breakfast room for Marie Theresa and Franz Joseph. 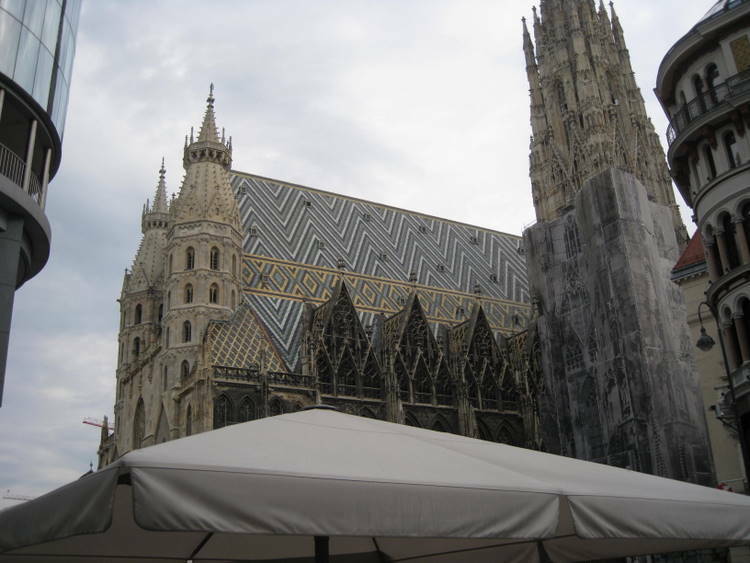 The dining hall, which was used up until the end of the monarchy, today has a cafe in it, and on the roof an observation platform overlooks Vienna. 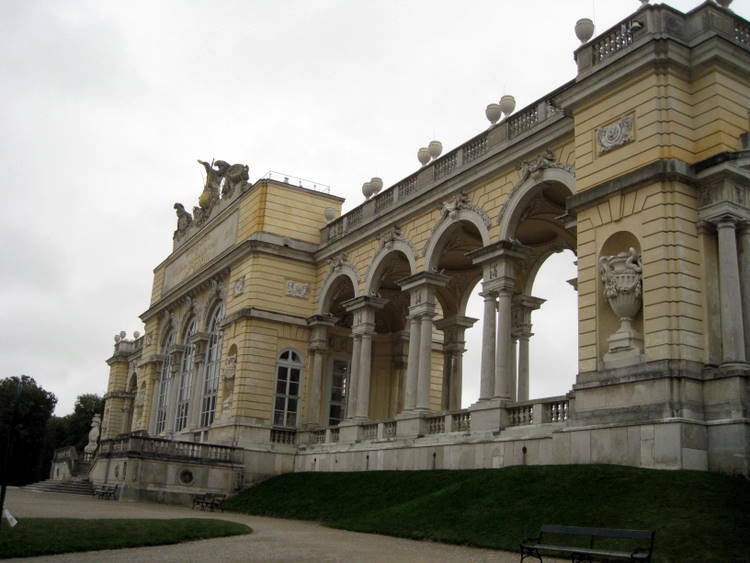 The Gloriette was destroyed during WWII, but had already been restored by 1947, and was restored again in 1995. My wife said she always dreamed up going u p there for cake and coffee. We found that there was a little train that went around the entire grounds so we took it up to the Gloriette. We each had a wonderful fancy cake (torte) and coffee. There were very few people there. It was very windy and cold, but the view was breathtaking. Several times we have seen concerts on TV that took place in the garden area. I have a model of Schonbrunn that I hope to make soon. We got back on the underground metro and stopped in the inner ring area where there were supposed to be nice hotels, but we didn’t see any close by. It was raining and getting colder so we didn’t to wander too far from the metro stop. We did find an attractive pub, the Gossip, and had a drink. We got back on the green line, changed trains at Karlsplatz and ended back at the Stephendom to find a place for dinner. It had started to rain harder. The first two restaurants were filled and we didn’t have a reservation. 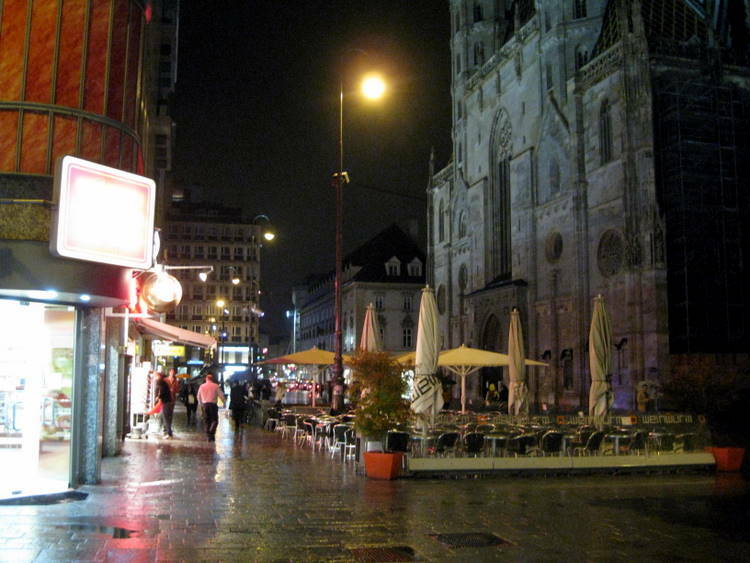 We did find a wonderful restaurant, the Gutenberg (Lugeck 7) about 3 blocks from the Dom, where we both enjoyed schnitzel. We got on the metro this time using the Orange line to the Westbahhof train station. By then it was raining very hard, and we weren’t sure about finding our stop on the tram so we took a taxi back to our apartment. This was our last day in Vienna. We have had a wonderful time and have seen a lot. We leave tomorrow for Salzburg. We checked the weather tonight and it was 42 with heavy snow in the mountains. It is supposed to rain some tomorrow, but be sunny on Wednesday when we plan on taking the “Sound of Music” tour.